Planning a wedding is no small feat as it is one of the most significant events in a person’s life. Thus, planning a wedding needs an enormous amount of attention, dedication, and patience. 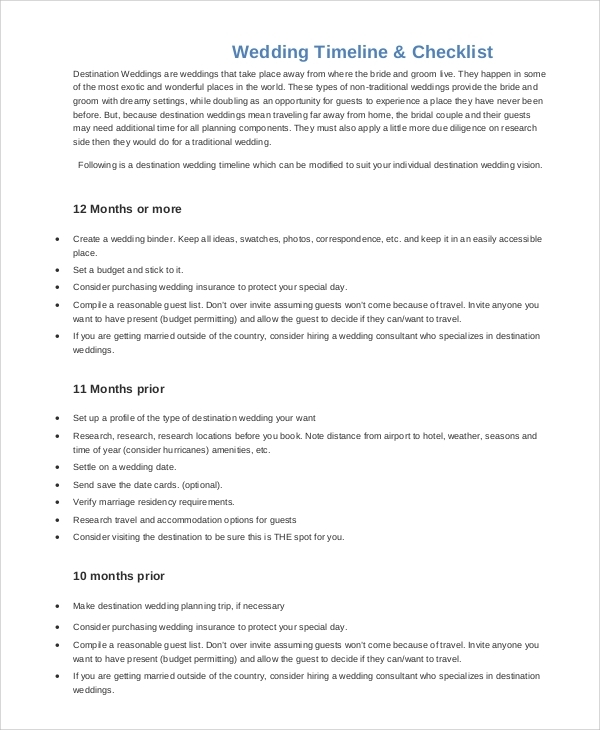 And, to ease the burden on you, printable wedding checklists exist so that you don’t miss out on any plan or activity which you have prepared for the wedding ceremony. The following is a list of Checklist Samples for you to see and know. 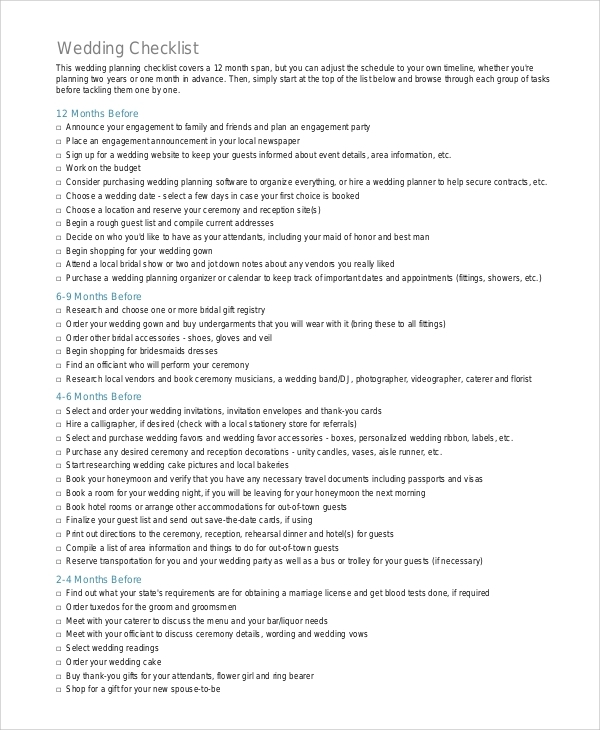 A Wedding Planning Checklist Samples is a checklist which lists all the activities that one has to perform before and on the wedding day itself. 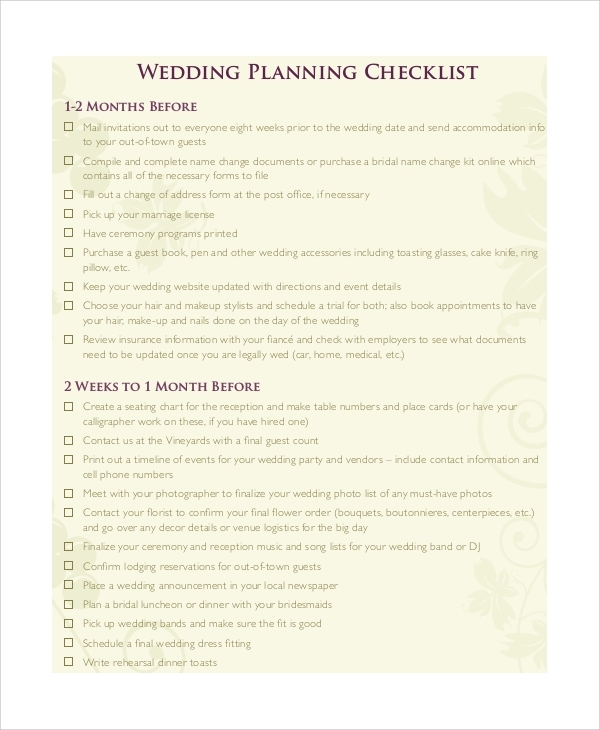 Such a checklist helps the planners to organize, arrange and decorate the venues and other ceremonies that may be held in conjunction with the wedding. Maintaining the timeline in a wedding is as equally important aspect as much as the ceremony and decorations go. A well-maintained timeline will obviously give a sense of order and decorum to the wedding ceremony, and it will also draw praise for the organizers for being punctual. This checklist thus keeps an eye on the timeline that is to be maintained. Weddings require a large and dedicated amount of money to fulfill ceremonial as well as decorative and venue requirements. 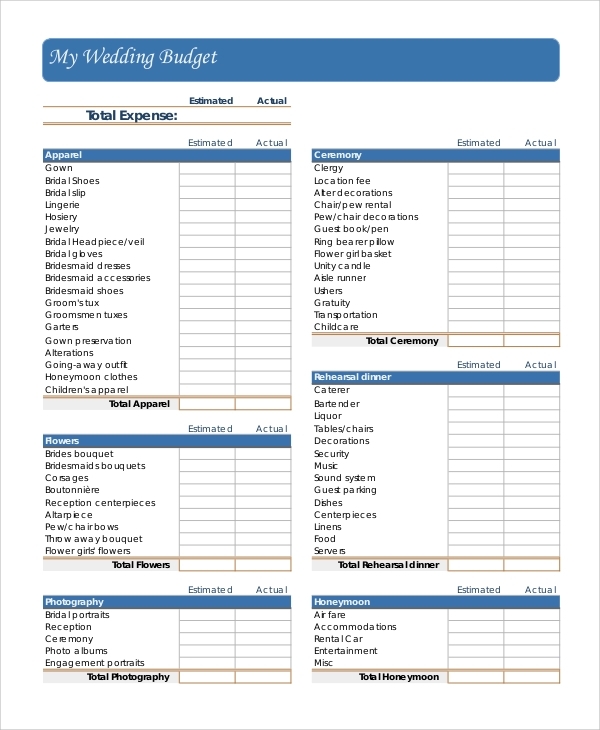 A wedding budget worksheet is a great way to keep an eye on the budget and the actual amount of cash that is being used to finance the wedding, and it is useful for clamping down on excessive spending on the part of the organizers. The Sample Wedding Checklists are useful for all kinds of wedding organizers who desire to organize a wedding on a grand scale. Since weddings involve a lot of dedication and involvement, it becomes necessary to maintain a checklist so that the activities and the progress of arrangements with regards to a wedding are kept at a close watch, and nothing would be left for the last minute. 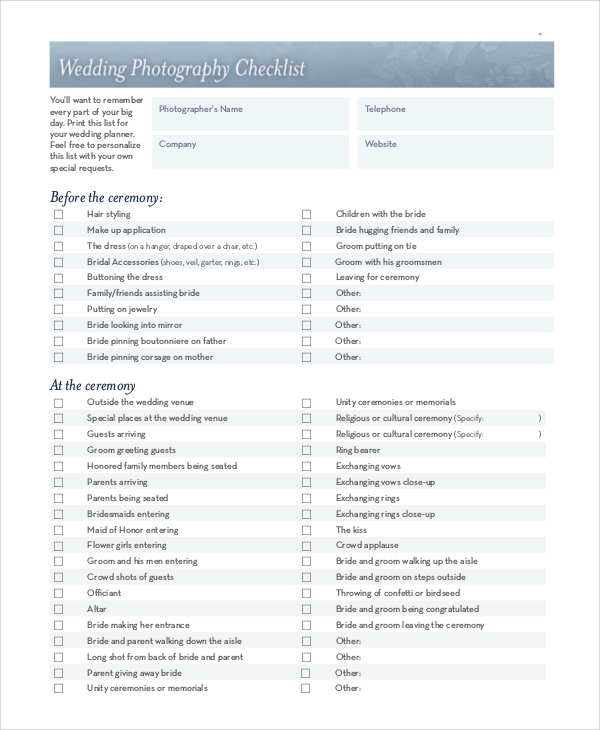 A printable wedding photography checklist is a checklist which ensures the arrangements made regarding a wedding photographer or a set of wedding photographers is an important type of wedding checklist as it keeps a check on the method and progress of selecting wedding photographers who will capture the moments of the wedding. A typical wedding checklist includes the activities or to-do plans that can be ticked against once they are done. The wedding checklist is key to organizing a memorable wedding for both the organizers and the newlyweds. 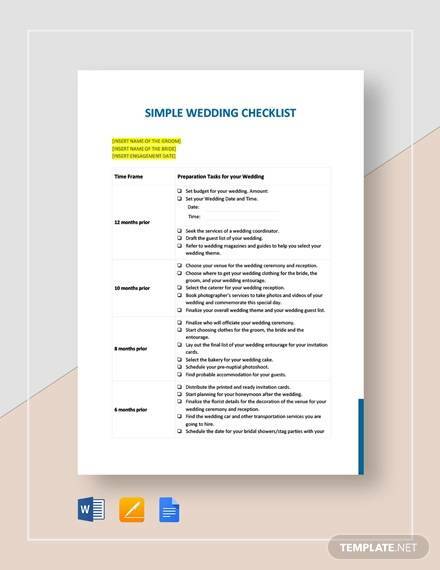 The checklist templates are aimed towards the people who have the responsibility to organize a marriage ceremony and to look after the arrangement of celebrations related to the wedding. 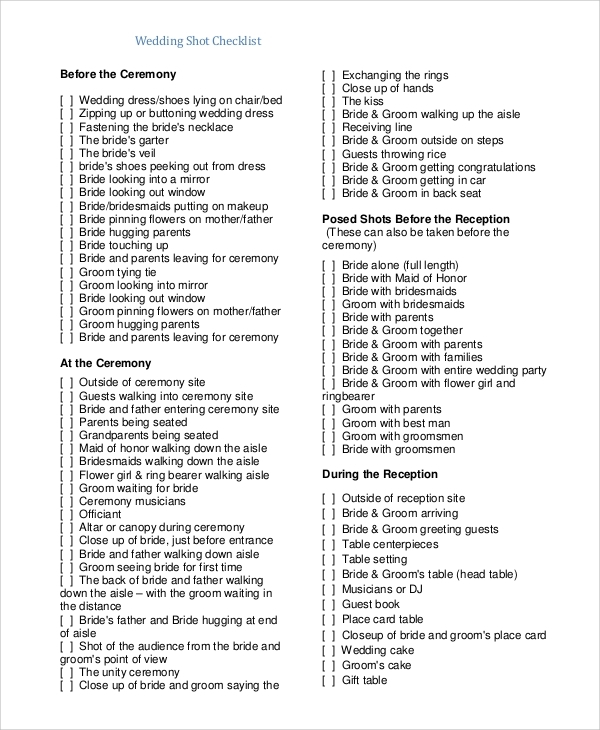 The checklists will help the organizers in organizing the wedding in an efficient, unburdened and punctual fashion. You can also see the Sample Baby Shower Checklists. 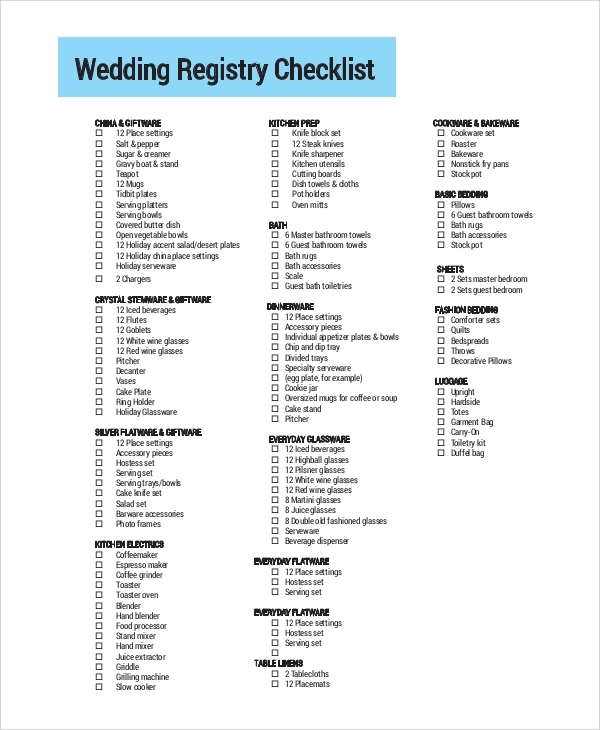 We have a large collection of Sample Wedding Checklist. Choose the one that will be the most appropriate for you. 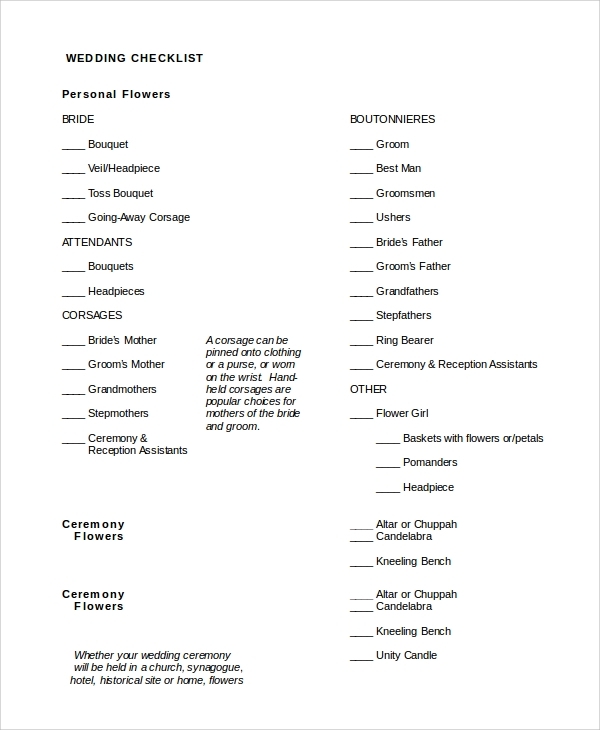 As the templates are editable, they can be filled with the necessary information and used as a wedding checklist itself. 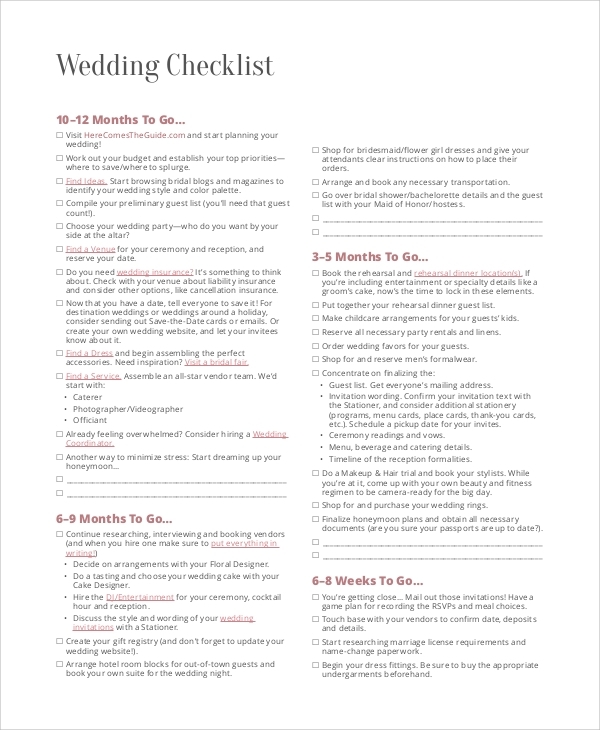 Or, the templates can act as a rough guide for you to create your wedding checklist.